The teaching of the apostles is the entire speaking of God in the New Testament, first in the Son as a man, then in the Son as the Spirit through the apostles. Although many matters are covered in the New Testament, such as baptism, head covering, foot-washing, and even the Lord's table, these items are not the central focus of God's speaking. Rather, the New Testament presents a full picture of God's New Testament economy, that is, His plan to produce an enlarged expression of Himself through the redemption, regeneration, transformation, and glorification of His chosen elect. This process has been made possible through the incarnation, death, and resurrection of Christ and through the outpouring of the Holy Spirit to produce the Body of Christ. Throughout the New Testament, God's speaking is through man and for man in order to gain a corporate expression of Himself. According to the Gospels, this expression was manifested in Christ; according to the Epistles, it is manifested in the church; and according to the book of Revelation, it will be consummately manifested in the New Jerusalem. 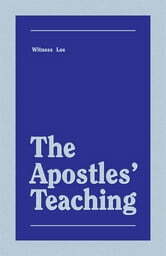 This is the essence and focus of the apostles' teaching.